괘불이란 절에서 큰 법회나 의식을 행하기 위해 법당 앞 뜰에 걸어놓고 예배를 드리는 대형 불교그림이다.이 그림은 괘불에서 많이 그려지는 영산회상도로 석가가 설법하는 장면을 나타낸 것이다. 숙종 14년(1688) 승려 화가인 학능 등이 그린 이 괘불은 길이 13.2m, 폭 8.07m이다. 전해오는 전설에 의하면 어느날 당나라 승려가 찾아와 괘불을 그리겠다고 하면서 3일 동안 출입을 금하라고 했다. 한 승려가 궁금해서 엿보니 파랑새가 입에 붓을 물고 그림을 그리는 것이었다. 엿본 것을 알게 된 파랑새는 사라지고 가까이 가서 그림을 살펴보니 어깨부분이 미완성이었다고 한다. 본존불인 석가불이 중앙에 서 있고 여러 보살 등이 석가를 에워싼 형태인데, 석가의 얼굴표정은 약간 딱딱해 보이지만 둥근 얼굴과 조화로운 이목구비, 둥그런 어깨선의 균형잡힌 신체에서 전반적으로 부드럽고 원만한 느낌을 준다. 주로 홍색과 녹색을 사용하였고 중간색과 금색무늬는 화면을 경쾌하고 화려하게 해준다. 이 괘불은 치밀하고 정교한 필치로 신체의 표현이 분명하고, 밝고 선명한 색채로 나타낸 다양한 꽃무늬가 돋보이는 17세기 후반의 뛰어난 작품이다. 또한 신체 각부의 표현이 조화를 이루며, 채색을 밝고 선명하게 하여 괘불의 비교 자료로도 가치가 있다. This type of large-sized painting used to be hung in the front courtyard of a temple hall at an open-air sermon session or ritual. 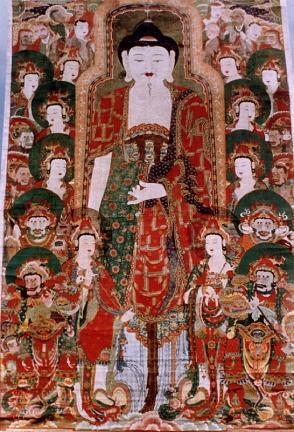 Made by monk painters including Monk Hakneung in 1688 (the 14th year of King Sukjong’s reign), this hanging painting measures 13.2m (L) by 8.07m (W). Legend tells the story of a monk from Tang of China coming to a temple and saying that he would paint a picture. According to him, no one should come near his place of work for three days. A monk at the temple peeked into the place out of curiosity. A blue bird was painting, with a brush in its beak. Upon finding out that someone was peeking, the blue bird disappeared. The shoulders of Shakyamuni Buddha remained unpainted. The image of Shakyamuni Buddha is at the center, surrounded by bodhisattvas. Shakyamuni Buddha looks rather stern. His round face, harmonized facial features, round shoulders, and well-proportioned body create a soft, comfortable atmosphere. Red and green colors are used a lot, with secondary colors and gold-colored patterns creating a pleasant atmosphere. This hanging painting features clear-cut portrayal of the body made with exquisite and meticulous brush strokes. Floral patterns made with bright, clear colors draw particular attention.